Since relaunching it as part of our rebranding, the site doesn’t only look better, but also works significantly better for our client, as the numbers show. We are happy that we could prove again that a good brand design, a well organised website layout and optimized code don’t only improve the brand experience, but also contribute to the client’s bottom line. 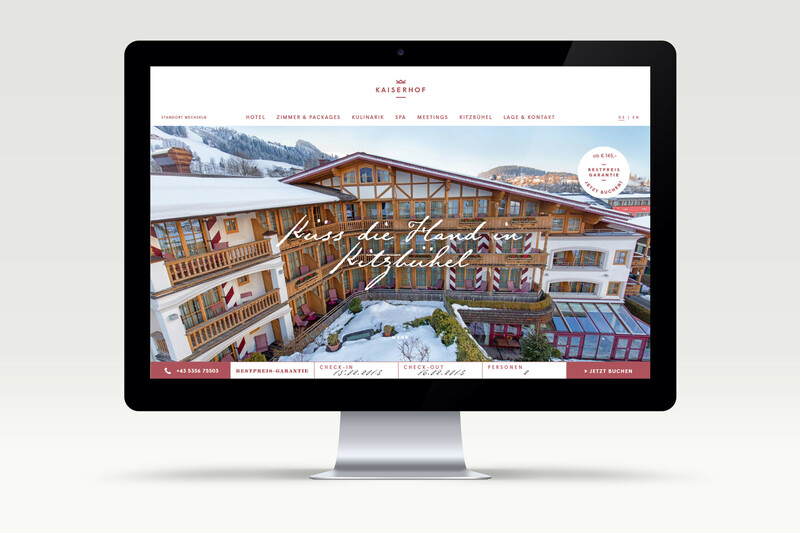 Since we relaunched the website of Hotel Kaiserhof in Vienna and Kitzbühel as part of our rebranding, all key performance indicators improved significantly: the percentage of visitors who leave the site after viewing only one page – the so-called bounce rate – decreased by almost 19%. The average time it takes to load a page was slashed by roughly a third. Both of these are factors are valued by Google, so the site was ranked better, which again resulted in a staggering 74% increase of visits from organic Google search results. All values are usage numbers provided by Google Analytics in the period 01.03.2018-31.05.2018, compared to the same period in the previous year, before our relaunch, 01.03.2017-31.05.2017. 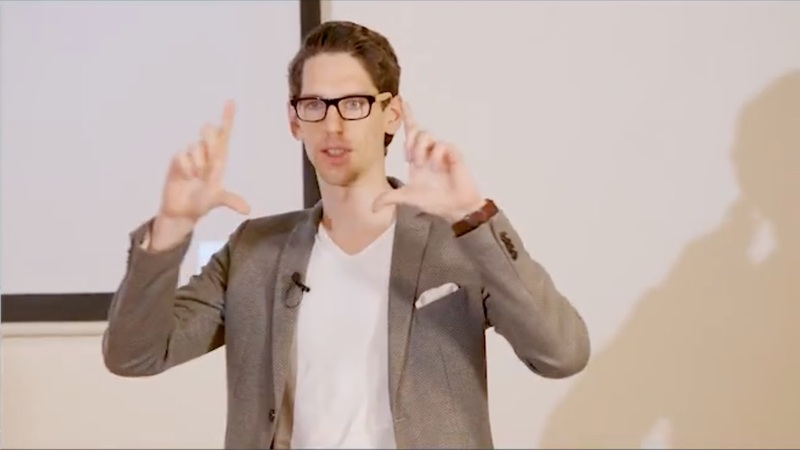 Nowadays, delivering a good experience for users is the most important part of SEO (Search Engine Optimisation): Google wants to provide users with the best matches for whatever it is they are looking for. When Google’s algorithms notice that users stay on a site instead of bouncing back to Google, it takes this fact as an indicator that it delivered the right search results. As a consequence, the position of the website in the search results gets more prominent. A good usability, a pleasant design and fast page loading times greatly add to the users’ experience and help to keep them on the site. 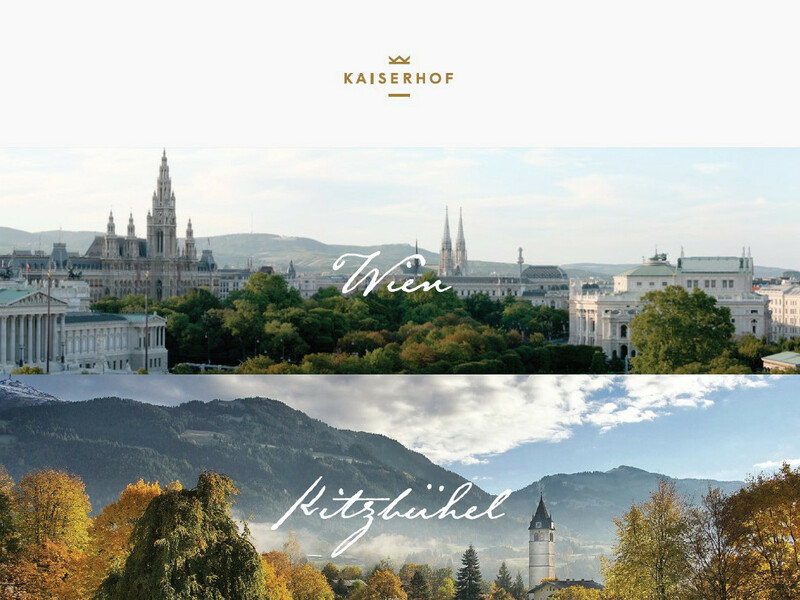 A consistent, atmospheric brand design draws the user into the brand’s world of Old Austria’s charm of the turn of the century. 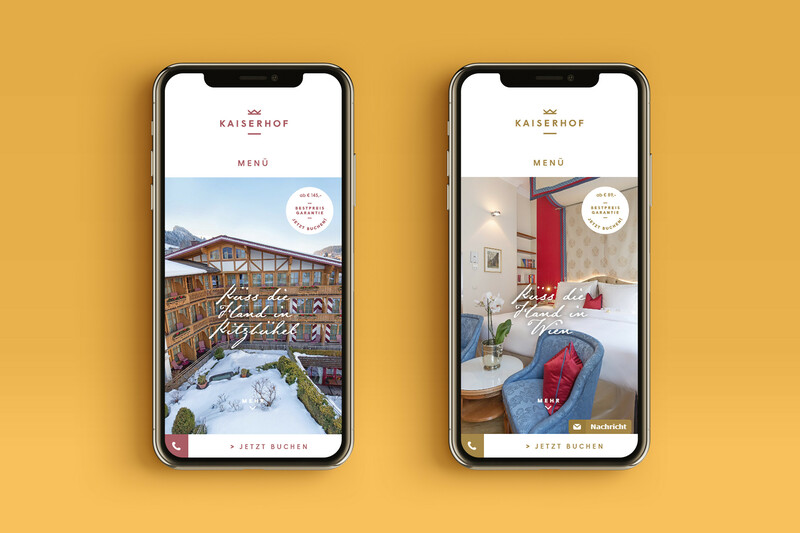 To intrigue the user and keep him on the site, we created a consistent, atmospheric brand design draws the user into the brand’s world of Old Austrian charm of the turn of the century. The main USPs of the hotels are presented over and over all throughout the website. All pages are laid out in a way that the user is guided through all USPs and ultimately always led to the rooms page to explore the hotel rooms – thus creating a natural flow towards sales. We paid a lot of attention to creating a smooth user experience – also in details like the booking form – and keeping it consistent with the look and feel of the brand. The locations in Vienna and Kitzbühel are differenciated by color. The mobile layout is stripped down to the essentials for an optimised usability. Fast page loading times are also an important factor for a good user experience – nobody wants to watch the loading bar. Besides server sided optimisations, we used all possibilities to reduce the file size of the images, that are pre-rendered on the server in all possible sizes and delivered according to the user’s screen size. Also, various parts of the code are compressed and loaded in a specific order. The technical details of this process are shown by Roland Schütz, our Head of Development, in his presentation on loading time optimisation here. 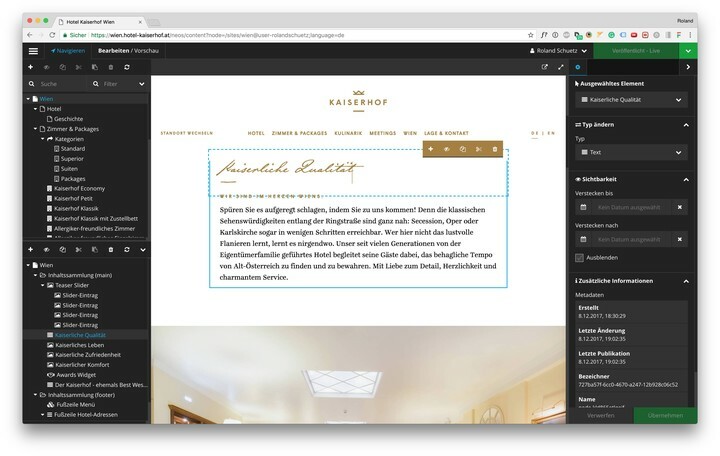 The easy-to-use interface of our Content Management System allows for intuitive editing of the content directly on the website. 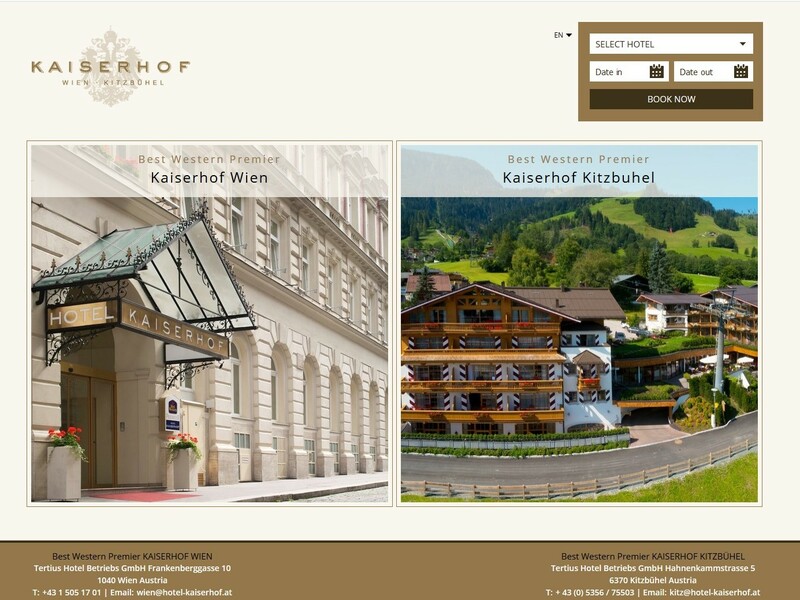 That’s how the home screen of the old website – leading to both Vienna and Kitzbühel – looked before our relaunch. Since we didn’t only redesign the website, but the whole brand design, we could create a much more atmospheric and clear look, that makes the brand stand out from the competition.